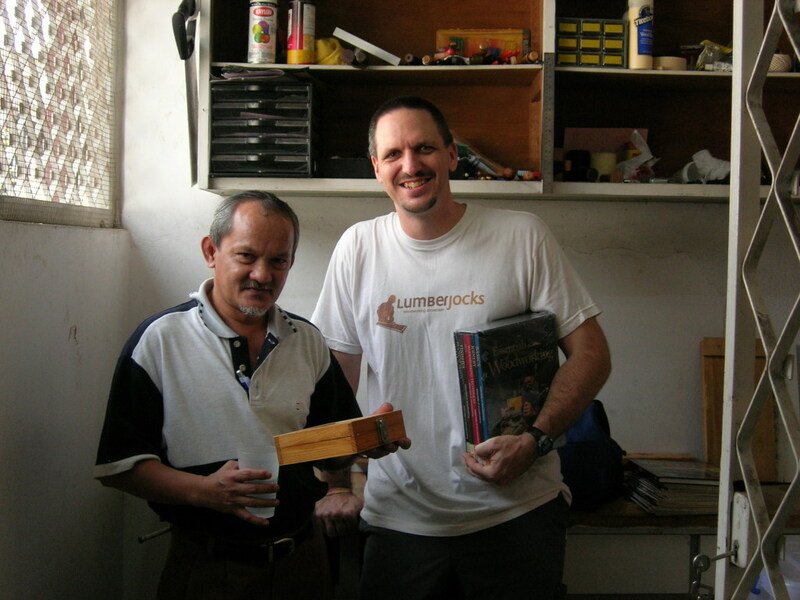 Found: Another Woodworker in Malaysia! A week or two ago, I got a private message on LumberJocks from a Malaysian (named Masrol) who had recently signed up. Turns out he only lives about 30 minutes away from me (which, in a large city like Kuala Lumpur, is nothing). Masrol is a recent retiree who has been woodworking for a few years (at least). Most of the tools in his shop, including the power tools, were purchased overseas and shipped to Malaysia; in at least one case, the shipping was double the cost of the tool! During our subsequent conversations, I offered to sell him my Ryobi router, and he was interested. So today he came by and bought the router (and the transformer needed to keep that American-made tool from frying). He also gave me a nice set of books from Taunton Press (articles from FWW). I, in turn, gave him a decent little stack of woodworking magazines as well as a book of projects compiled from Wood magazine articles. I think it’s great that you guys could exchange so much in such a short visit! That’s really cool. Glad everything went well. Those Taunton Press books are the best in the business in my opinion, and quite expensive. Kudos to you! I bet you made his day as much as his visit made yours! If it makes you feel any better, we don’t yet have a woodworking club here yet, either. I am curious – do you know if there are any woodworking magazines published in Malaysia? Hi Traci, I’m fairly certain that there are not any locally-published woodworking magazines. The only ones I have seen in the stores are imported from the UK or US. But it’s not surprising since woodworking is not a hobby, and even as a profession is mostly limited to low-budget cabinetmaking. Hi Eric, can you share contact of Masrol? I just recently move to KL and do not have any woodworking fella around. It will make me networking deal with local woodworking buddies. I am a design and build for carpentry woodmaking factory. Is anyone need my help? Hi everyone, my name is Amos from Ghana but i am in Malaysia curently. I am a carpenter and a machinist who can opperator all kinds of carpentery machines for example table saw machine, mortising machine, dimention machine, all tyes of planning machines and all types of hand machines.